Decade ago there was anglo-sizing the local language and now it’s all about indian”ising” the foreign tongue. As a gesture to bring together the large non English speaking population residing in the villages of our country-a new measure was recently flagged off. The new service that will provide the digital user interface in all regional languages is a new add-on service for the much praised “Digital India” campaign. This will not only make it terribly easy for the rural population to interact and use the digital interface but also will eradicate any feelings of being “used as a votebank” during elections. Nick named “e-bhasha” platform, it will spread digital content in many local languages. The good news is, the e-bhasha platform is actually now in a polishing stage, so one may find it available soon. According to the Department of Electronics and Information Technology (DiETY), the service will be working in full swing within 2 months. As Modi emphasized on the importance of “utilizing e-governance to bring about great changes in governance”, this e-bhasha platform will make e-governance of pensions, banking, judiciary etc easy to comprehend. “We want outcome based research. At the end of the story, I must have these tools which will be useful and which I will now give it to the country (saying) these are the tools for you to use,” DiETY secretary Ram Sewak Sharma reported. Sure multilingual development is no easy feat but is certainly a very useful one considering that more number of people own a mobile phone than a toothbrush. The ever growing internet population in India will not die out atleast for another 2 decades, keeping that in mind, localizing the English language is a thoughtful measure. It will further enhance the internet population and decrease the price range due to the voluminous internet subscriber base. Our neighbor, ie the Chinese government’s e-portal surprisingly runs on minimal English and most of the texts depicted there is in Mandarin. The Chinese government has deliberately put the local language in command by just ignoring the usage of English. It shows the government has not turned a blind eye towards it non-english speaking population, which is majority in China. Even in India, less than 20 percent of Indians can read or write English language, and today more than 90 percent of the Govt content is in English language. Now that even our government is ready to provide it’s users more than one language pallet, the access to digital content must not suffer break downs. 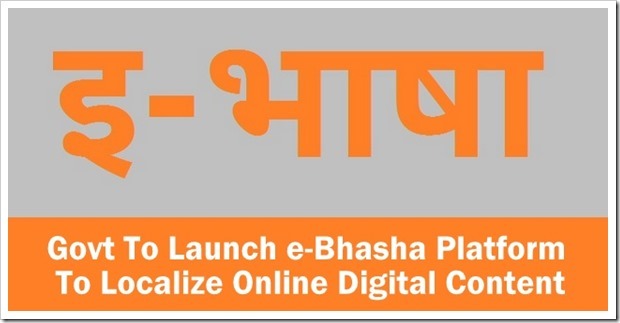 Though the e-bhasha platform will only debut in 2 months, many rumours and expectations are afloat. One of them is the user interface may suffer a break down. In that case we must be aware of the government’s dedicated team that is working for the last few months to help the Digital India campaign grow. But before the service rolls out, a tad optimism might surprise us. The e-bhasha feature is a feature unique to Modi’s governance style. Moneycontrol.com goes hindi – Localization a trend now?